We sell a lot of heavy and bulky low cost items that are vital to our customers. The only way we can afford to do this is to have two different levels of free shipping offers. Australia Post is ALWAYS the default shipping option. 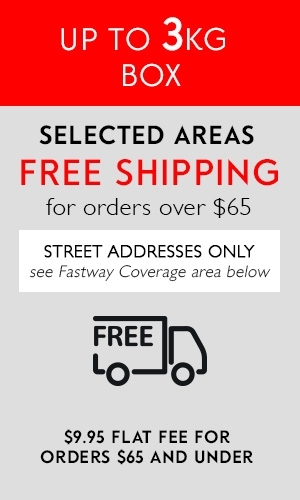 If you qualify for the Fastway free shipping offer, please manually select it at the checkout. Please ensure your delivery address is a street address. Fastway will not deliver to PO Boxes or Parcel Lockers. 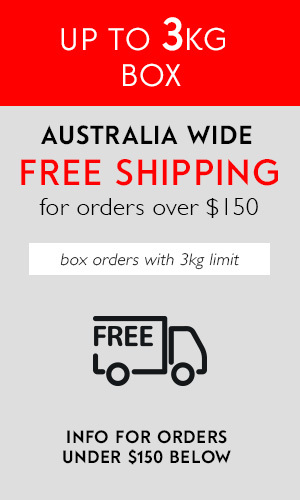 The Australia Post Road Freight tab and the Fastway Courier tab below give details on our free shipping offers for parcels over 3kg Australia Wide. We have a 15kg limit on all orders. Placing multiple orders is necessary if you need to purchase more than 15kg worth of product. For Australia Post orders over 3kg, there is a flat fee PLUS a charge for the weight of your parcel. The FREE SHIPPING OFFER is listed for your zone and a list of the postcodes that cover your zone are provided. There are a large amount of low cost and heavy items in our store. We cannot afford to keep them on the shelves without this shipping structure. For Fastway Couriers over 3kg, there is a set price for different weight bands. It's usually cheaper, but does not cover the whole country. If you're eligible, you will see it appear at the checkokut and you can manually swap. No PO Boxes or Parcel Lockers. A full postcode list is provided. We do not offer any free shipping options for Express Post. We do understand that some of these shipping charges are expensive. We have negotiated freight charges with both carriers and pass on every saving we make. We subsidise the shipping on at least 3/4 of our orders. Our default shipping option in store is set for Australia Post Road Freight. Your shipping costs include tracking and insurance. Authority To Leave should be selected with caution as our insurance coverage ends with a successful scan from the driver. We urge all customers to sign for their parcels. For parcels over 3kg in weight, you are charged a flat rate PLUS a per kilo charge for the full weight of the order. This rate changes depending on your location. The easiest way to estimate your charges is to place all items in your cart, view your cart and then add your postcode in to our shipping estimator. All shipping options and their charges will be shown. We are unable to ship parcels larger than 15kg. Please place multiple orders, keeping each one under 15kg in weight. If you are ordering bulk cleaning products, you can only add two of our 5kg / 5 litre options to an order. The weight of the containers is also used in our calculations. Express Post orders placed by 1pm AEST will leave us the same day (excluding weekends, public holidays and any item marked special order). If you are within the Australia Post Express Delivery Network, you will have your parcel next business day. CLICK HERE to find out if your postcode is within the Express Post Delivery Network. Express Post Parcels over 500g are charged at a flat rate PLUS a per kilo charge for the full weight of the order. This rate changes depending on your location. The easiest way to estimate your charges is to place all items in your cart, view your cart and then add your postcode in to our shipping estimator. All shipping options and their charges will be shown. We are able to provide a flat rate ‘best price’ box delivery service with Fastway Courier to around 90% of the population. For many customers, it is a significant saving on using Australia Post. Unfortunately it’s not available to everyone. Even if Fastway delivers to your area, it may not be eligible for this reduced price. If your location is eligible, you will see the option available in the checkout. This is not the default shipping option, but you can manually switch to it in the checkout if you see it. No PO Boxes or Parcel Locker addresses please. We can only send to street addresses with this service. This is a road freight service and is subject to delivery times anywhere from 1 to 14 business days depending on your location. A full list of the postcodes covered is listed below. Parcels are sent using either Fastway Couriers or Australia Post and include tracking & insurance. You can have your items delivered to a home address or work address with all three options. PO Boxes and Parcel Lockers are available for Australia Post only. You choose the shipping method as you go through the checkout. No. A calling card will be left if you are not home. Undelivered Australia Post orders can be collected your nearest post office. Undelivered Courier orders can be contacted to arrange a suitable redelivery time. Your first redelivery is free of charge. Any additional attempts will incur yoru shipping fees again. If you choose Authority To Leave, the parcel will be left at your address in a safe place. Proceed with caution as your insurance coverage ends when the parcel is left at your address. How quickly will my order leave your warehouse? If you choose Australia Post Express Post, an order placed before 1pm AEST on a business day we are open will leave the same day. For Courier and Australia Post regular shipping, 95% of orders leave the same day or next day. There are some short delays around special events, long weekends and sometimes at the start of the week. Are all my items in stock? We only sell what’s physically in our own warehouse unless the item is marked as a special order item. This is why 95% of our orders leave the warehouse within 24 hours of your order being placed. Once your parcel leaves our warehouse, delivery time is dictated by the Courier or Australia Post. If you choose Express Post and you are within the Express Post delivery area, your parcel should arrive the following day. Your parcels leave from the 2250 postcode (Central Coast of NSW). Delays can occur during busy periods, including public holidays & major events. 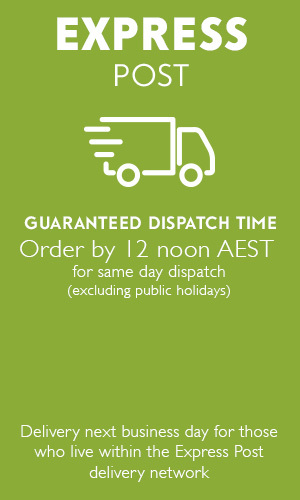 Please note, there is no guaranteed delivery time for Australia Post regular services or Fastway Courier. Delivery to long distances can take up to 7 to 10 business days. Your parcel is covered for damage during transit or going missing during transit. Please report all damage within 48 hours of your parcel arriving to be eligible for a claim. If you choose Authority To Leave, once the driver scans your parcel as delivered, there is no more coverage for a parcel missing during transit. 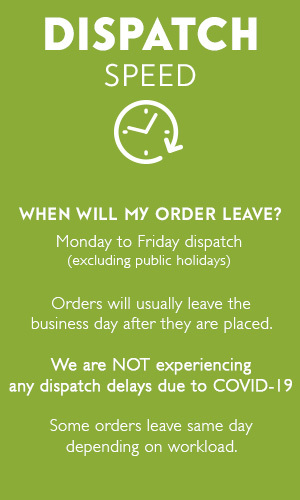 Please choose this option carefully as we cannot reship orders or process claims if you choose Authority To Leave and there’s a scan showing delivery. When your parcel leaves our warehouse, you will receive an email from us and another email from the Courier or Australia Post that contains your tracking number. These emails can get caught in spam filters, so please check your spam folder. How do you calculate the weight of my parcel? Each item in store has a weight estimate attached. We take in to consideration the weight & size of the parcel (cubic weight) and the packaging we place around it so it arrives safely on your doorstep. Please note that large items that do not weigh very much are calculated on their physical size. Why are your shipping charges so complex? We ship a lot of hard to find, large, heavy & inexpensive items all around the country. The only way we can provide this service is to adopt a USER PAYS system. The weight of your parcel & your location form the basis of the calculations. The order total comes in to play when we work out FREE SHIPPING offers, and they differ depending on your location. All the charges will calculate automatically during the checkout and we do have a shipping estimate calculator on our Shopping Cart page if you’re confused by what’s above. Simply add your items to the cart and put your postcode in to the shipping calculator to find out what the charges are. What do you use to pack my parcel with? We are as eco-friendly as possible when packing your parcel. We rarely buy new boxes for packing. When we do, they’re plain brown boxes. We gather boxes to re-use from local businesses, so your order may arrive in a rescued wine box or something from a supplier. All the packing materials we receive from suppliers are re-used and we rescue old newspapers to give them one more journey before they are recycled. 99.99% of satchel orders are packed in zero plastic jiffy bags. On rare occasions, a largish order under 500g may end up in a plastic courier satchel and some recycled bubble wrap. We recycle newspaper for a lot of our box orders. If you have allergies to newspaper, please let us know when you place your order so we can ensure we don’t use it to pack your parcel. On rare occasions, we may use a small amount of bubble wrap or a plastic bag to protect something in your order. We recycle bags and bubbles from suppliers, you can put them with your RedCycle soft plastic for recycling at the supermarket.